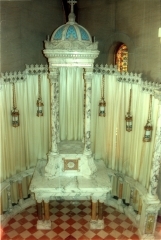 The following text is taken from a letter from the Kaletta Statuary Company to Rev. James I. Douglas, Pastor of St. Ann’s, dated 1931-10-13. 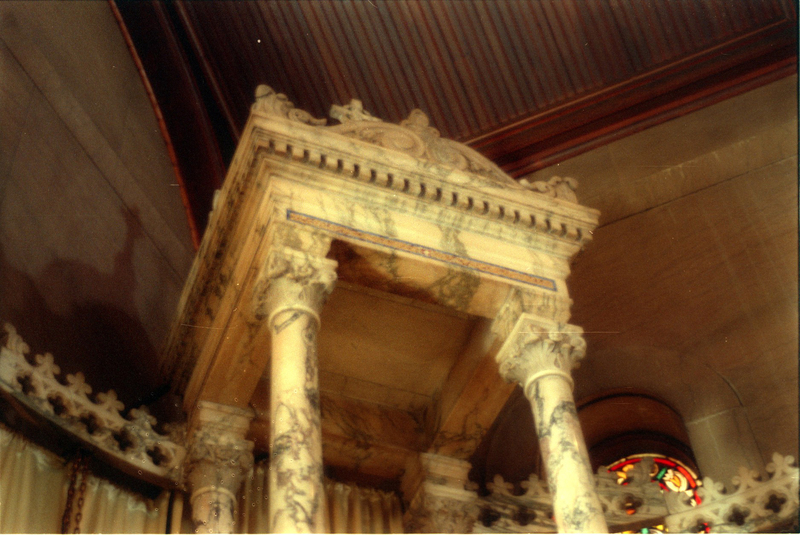 It has been reformatted and edited for spelling and punctuation. 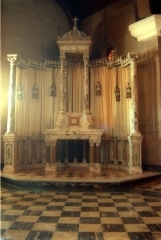 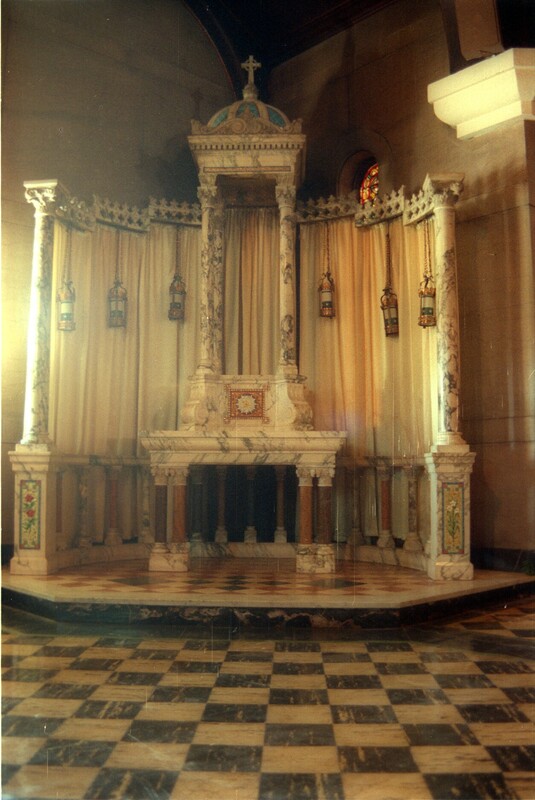 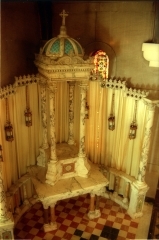 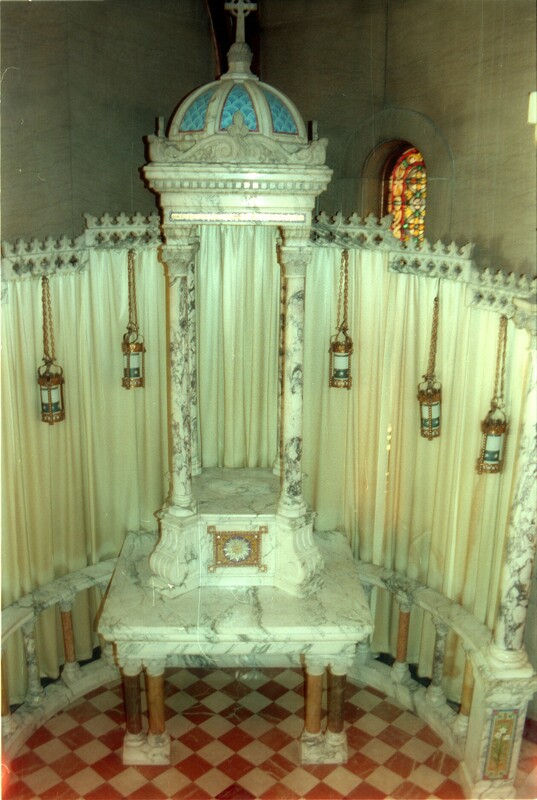 We propose to furnish a Marble Shrine to the Blessed Virgin, as per plan and specifications, which includes Marble Platform, Brass Tabernacle Door and ornamental Cresting and supports for Drapery, Drapery and Lanterns, and the Statue of Our Lady of Victory in Special Decoration for the sum of Nineteen Hundred and Eighty Four Dollars ($1984.00), set up complete in St. Ann’s Church at Page Blvd. and Whittier St. This includes construction work under the floor to support the Shrine. 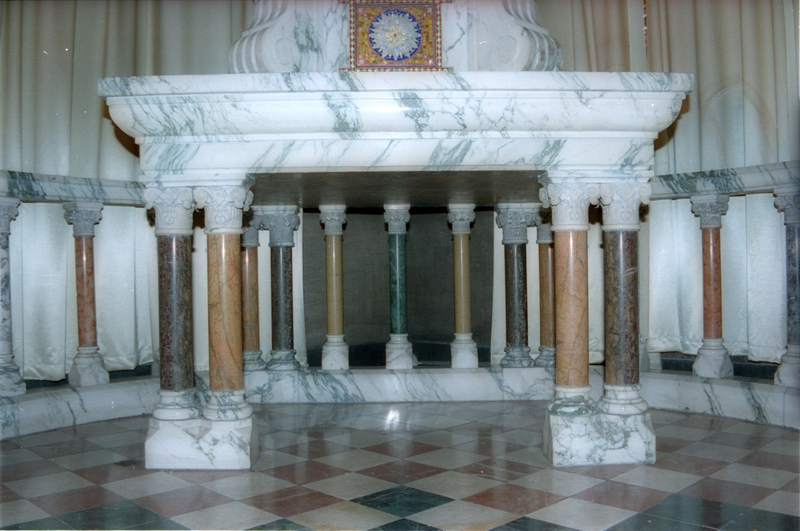 Part of the work will be done here in our Marble shop and part imported from Italy. 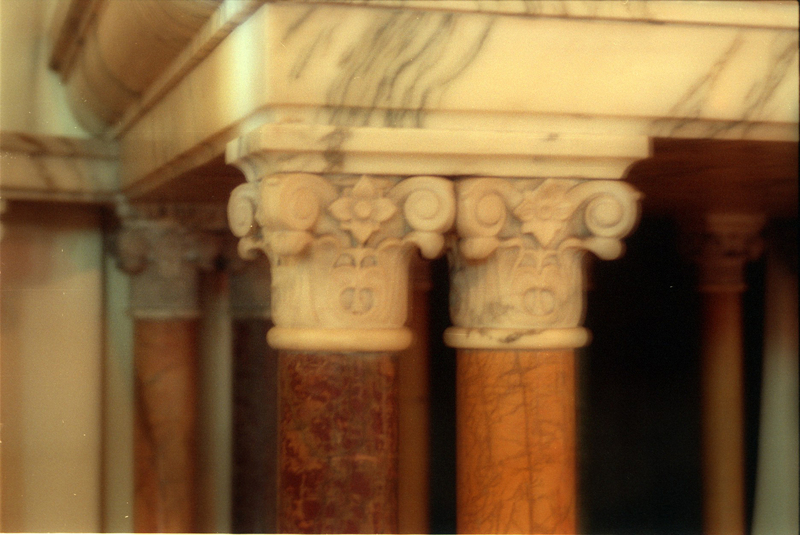 Price is based on the fact that Marble work from Italy comes in free of duty and import declarations are to be furnished. In constructing the Marble Shrine to the Blessed Virgin all marbles to be used are to be of selected stock and finished in first class manner. 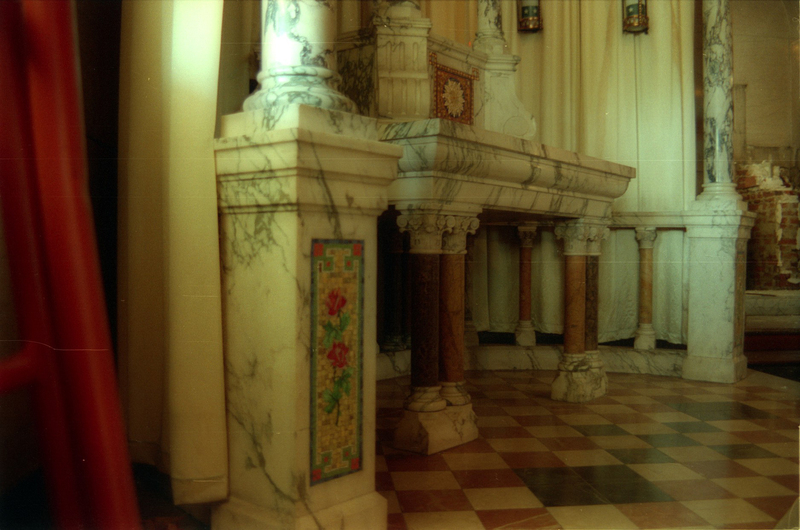 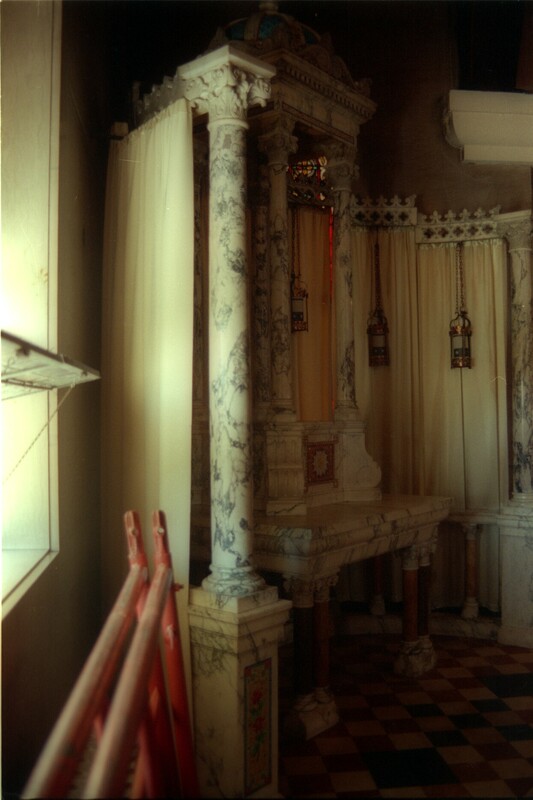 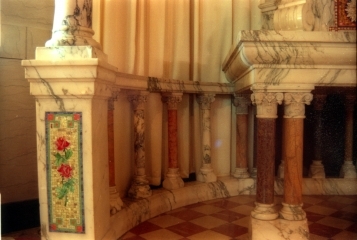 The Altar proper to consist of table constructed of veined Italian marble resting on eight columns to alternate between Rouge de Autumn and Breccia Violet on a darker colored marble that can be selected by the purchaser. 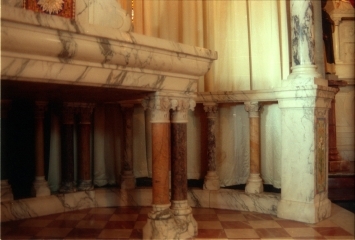 The plinth or socle under statue to be of white Italian Marble with a Mosaic Inlay in the front. 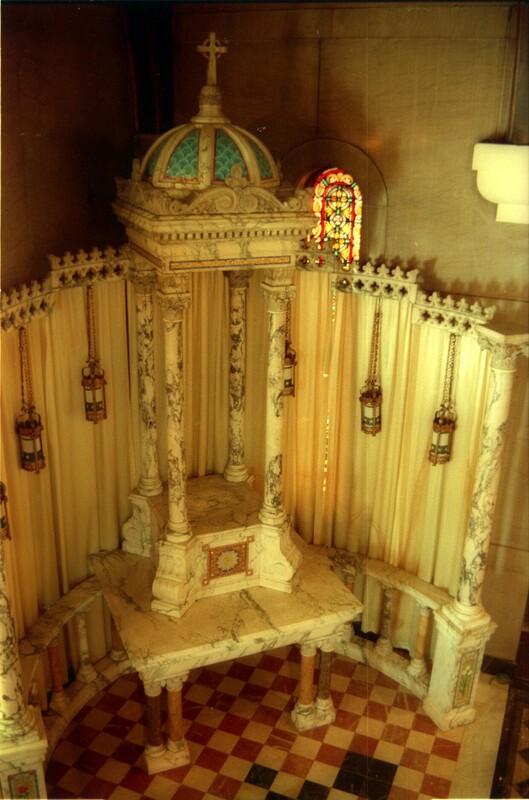 A Brass Tabernacle Door is to be provided and a Tabernacle built in for use as a Repository on Holy Thursday. Bases, Caps and Cornice constructed in veined white Italian Marble and the four columns Greek Skyros Marble. 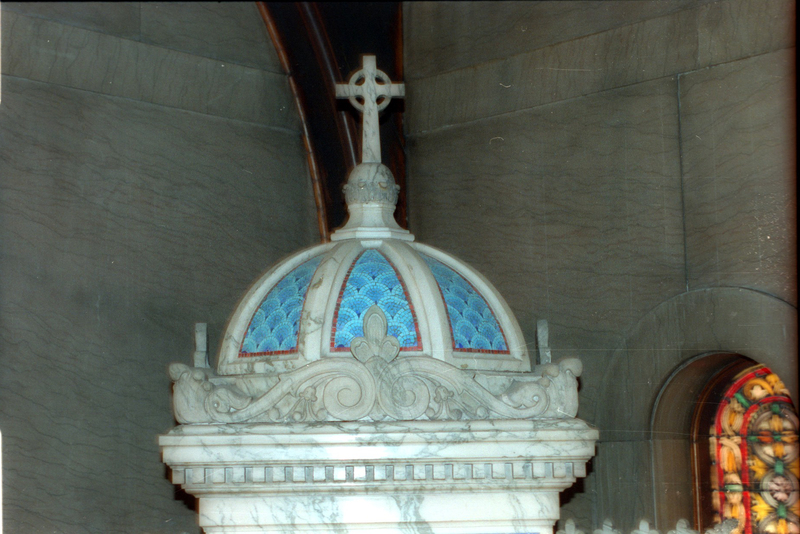 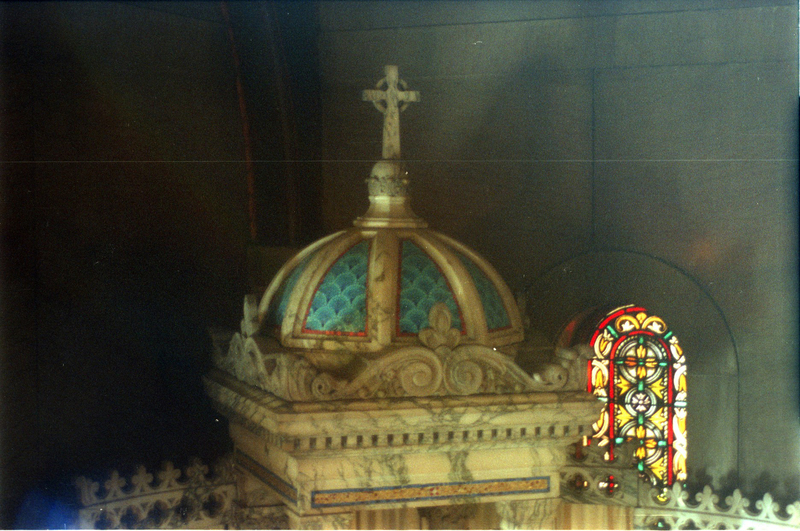 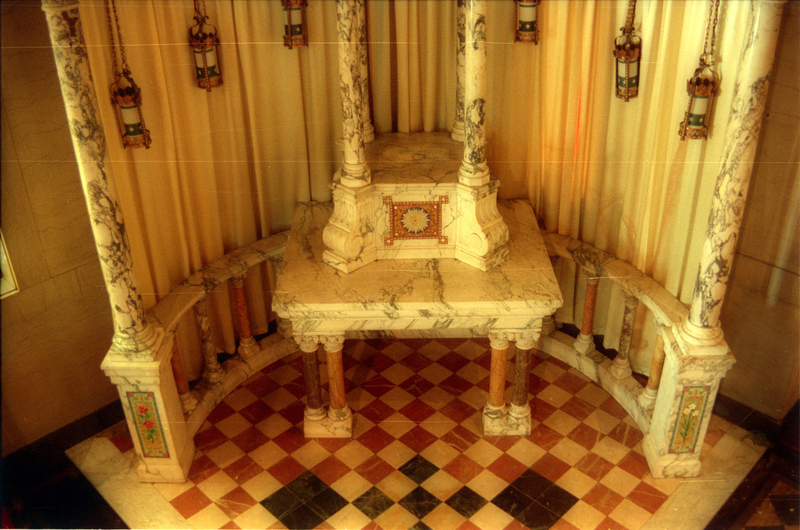 The Dome top and Cross above columns to be of white Italian Marble inlaid with mosaic panels and the Cross of Celtic type. 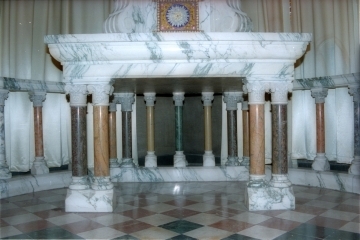 Pedestal constructed of veined white Italian Marble with Mosaic Inlay in front face, bases and cap of column also of white Italian Marble and the column shaft of Greek Skyros Marble or Onyx. 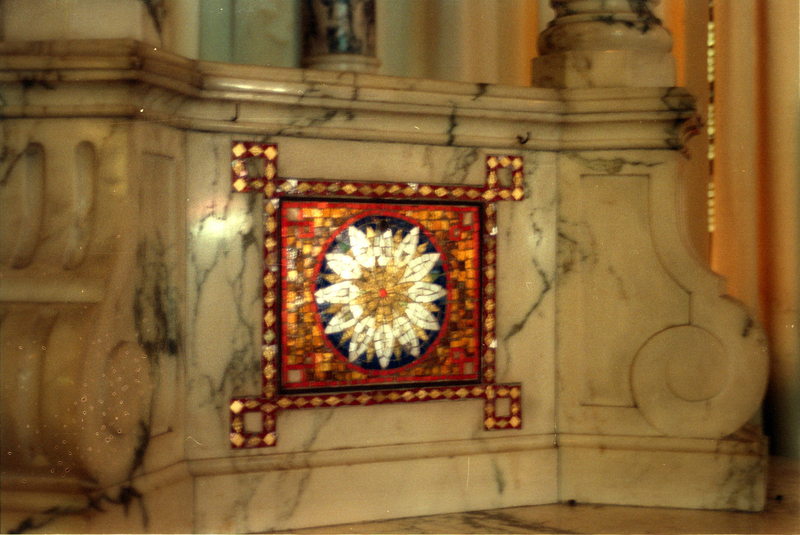 A Marble Vase is to surmount the cap of each column. 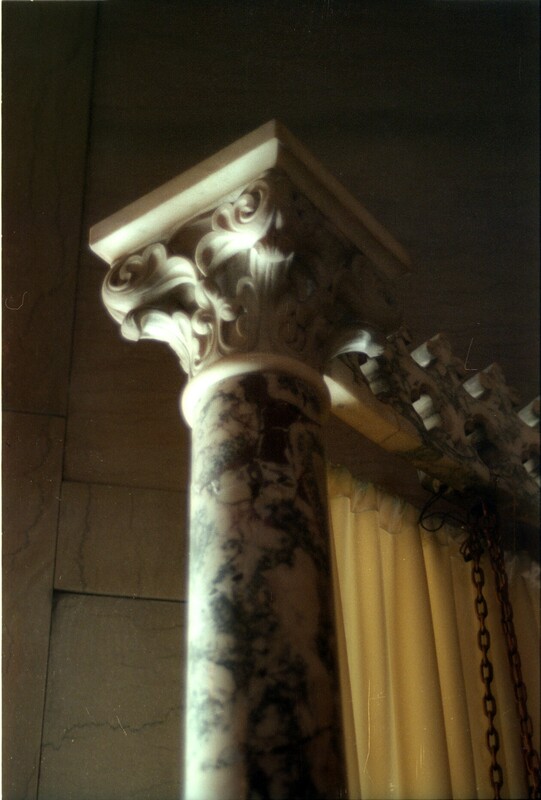 Base and Cap Moulding of Railing to be of veined white Italian Marble as also the base and cap of columns. 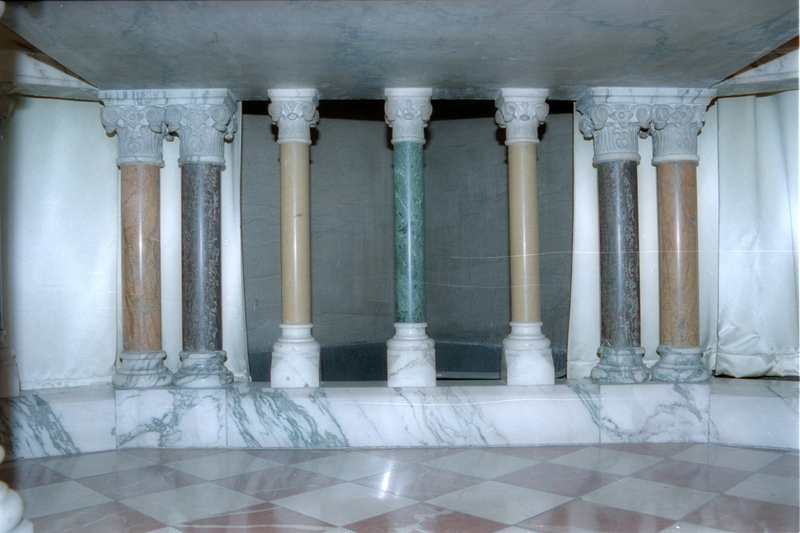 The column shaft proper to be of colored Marbles: the first one, an Alps Green; the second, red Altico; the third, a Convent Sienna; the fourth, a Yellow Verona; and the two rear columns of Red Verone, the center columns of Black and Gold Marble with the proviso that purchaser can make other selections if list of marbles do not suit. The riser of Platform face to be of Black and Gold Marble and the tread or border piece of white Italian Marble. 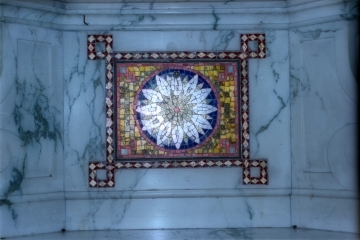 The field to be inlaid with pink and white Tile and pattern of green and red Tile. 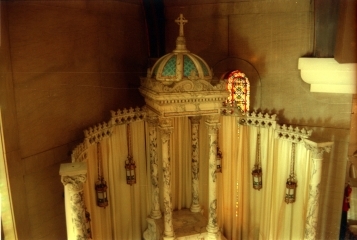 The Curtain Hangers consisting of open work filigree design in cast Bronze or Marble, cast Bronze recommended, with supports provided for each elevation. Curtain Hangers to be provided for the velour drapes. 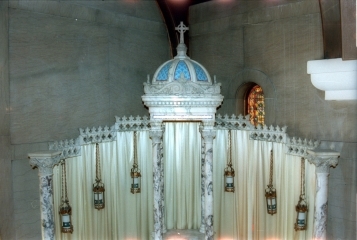 The drapery hangings for the back of Shrine to be a blue selected by the purchaser and draped beautifully in folds on the hangers provided, with orphreys attached. 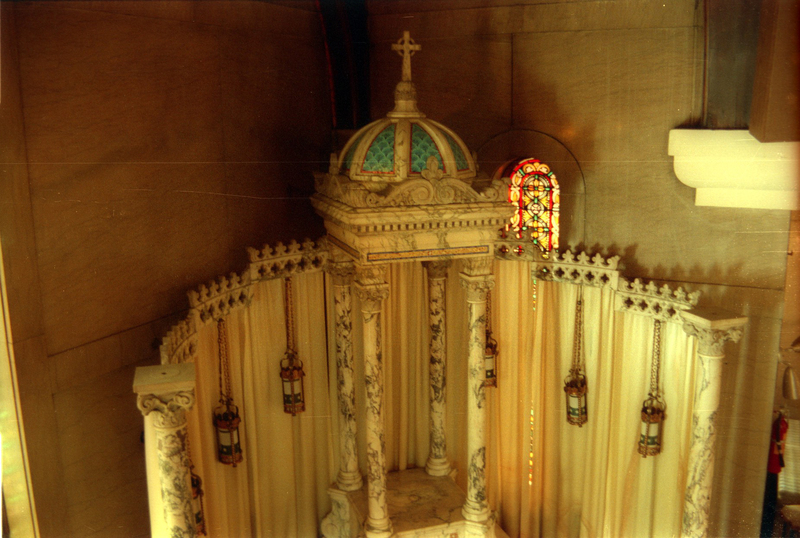 The lighting fixtures or lanterns of which there are six (6) suspended from the curtain hangers are to be selected design approved by the purchaser, the cost not to exceed $15.00 each.